An ensemble of unusual instrumentation will grace the Grass Valley stage Feb. 17 in a performance presented by InConcert Sierra. 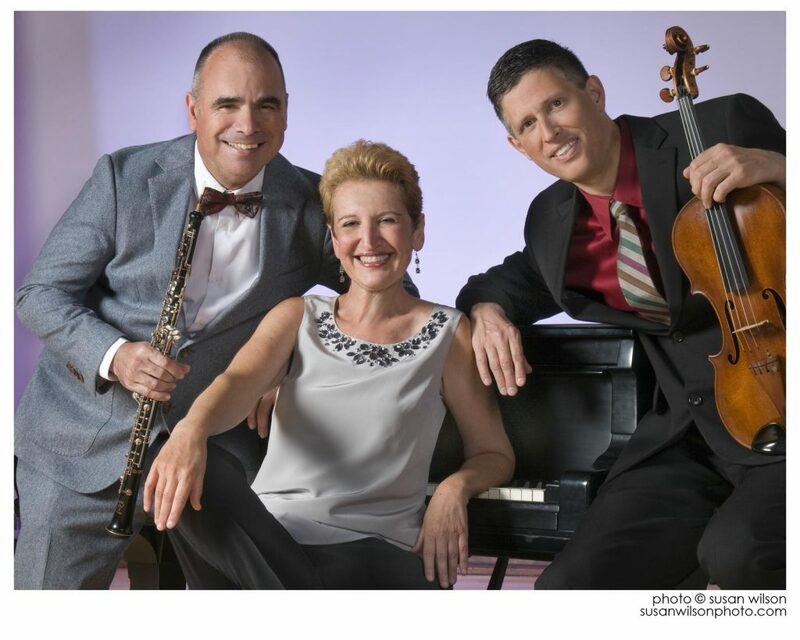 Ensemble Schumann is a chamber music trio featuring viola, oboe and piano. The rare combination of instruments allows each to musician to shine. The deep, soulful sounds of Thomas Gallant’s oboe, paired with Steve Larson’s shimmering viola, come together with the glue provided by pianist Sally Pinkas. “Thomas Gallant and Steve Larson, in partnership with pianist Sally Pinkas, make some of the most blissful sounds this side of nirvana. Truly, this is exquisite music, exquisitely played, and exquisitely recorded, and it’s definitely recommended to all,” according to Fanfare Magazine. Their program will feature German and Austrian composers, including a work by their namesake. The full program has “Märchenerzählungen” for Trio, Op.132 by Schumann; Mozart’s “Kegelstatt” Trio for Oboe, Viola and Piano in E-Flat Major; a “Trio in D,” Op. 61 by Herzogenberg; and “Eight Pieces for Trio,” Op.83 by Bruch. These musicians are each accomplished in their own right, having performed individually at notable venues, including Lincoln Center, the Frick Collection and Carnegie Hall in New York City, Jordan Hall in Boston, Wigmore Hall in London, the Library of Congress in Washington, D.C., and the festivals at Tanglewood, Ravinia, Lucerne, Spoleto and Mostly Mozart. Performing together since 2005, Ensemble Schumann has been featured at the prestigious Da Camera Series in Los Angeles, at the Clark Art Museum in Massachusetts and on Live From Fraser on WGBH Radio in Boston.​ Their recordings on the MSR Classics label have received high praise in such publications as Gramophone, Fanfare, and Audiophile Audition. There will be a pre-concert forum at 1:15 p.m. in advance of Ensemble Schumann’s 2 p.m. performance. General admission tickets are $38 and are available by phone at 530-273-3990, online at www.inconcertsierra.org (ticketing fees will apply), and in person at BriarPatch Co-op or at the door on the day of the concert, if available. There are a limited number of free youth passes with the purchase of a general admission ticket. Youth passes must be arranged in advance, please call 530-273-3990 to reserve. The concert will be presented at the Seventh-day Adventist Church, 12889 Osborn Hill Road in Grass Valley. For more information, please visit www.inconcertsierra.org or call 530-273-3990.